Before getting my hands on the bulk lot, I had never heard of the Exo-Force theme, but I’ve got to say, I’m quite impressed! Exo-Force was clearly inspired by Japanese anime and manga, and star a lot of different types of mechs and combat vehicles. The Exo-Force were pitted against the little robotic dudes (about the same size as the minifigures), all who had some pretty great looking mechs of their own. Over the next few weeks, I’ll be taking a look at some of the sets, with more to come later on down the track. 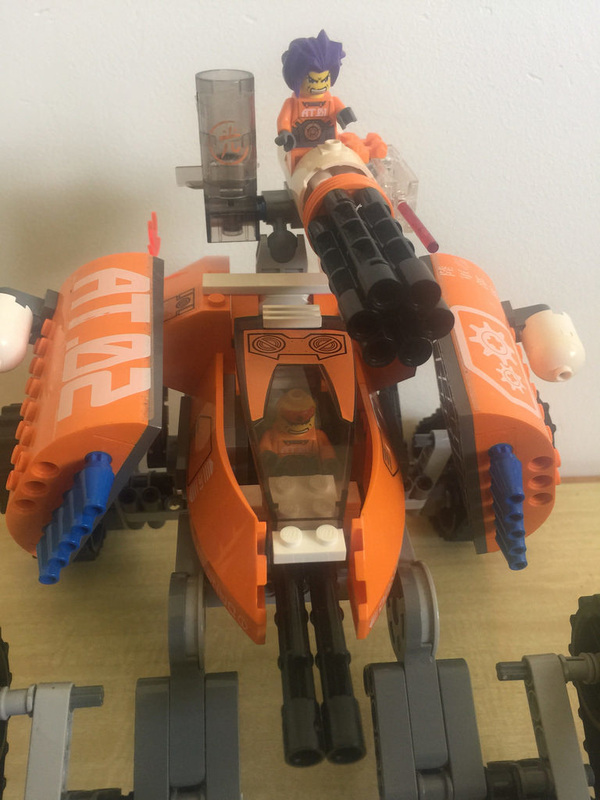 Exo-Force as a theme was introduced in 2006, and left the shelves two years later. I’ve got a number of the original 2006 sets, and these are extra special, due to the light up brick “power core” in the middle of the mech. It’s connected to the weapons the mech holds by a “fibre optic cable” or clear tube. All in all, these are pretty unique sets, with some interesting looking minifigures. Many of the sets can also be combined with others to create new models. 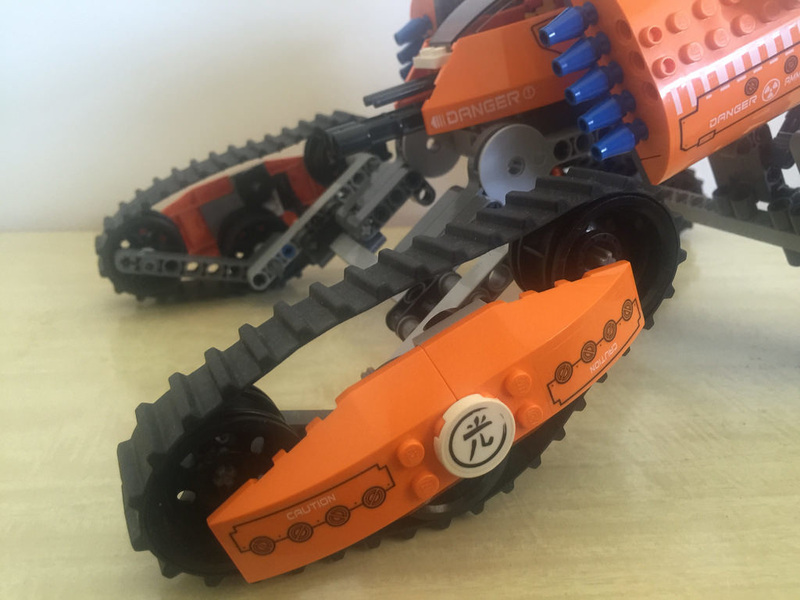 In this case, the tank can be combined with 7709: Sentai Headquarters to create the Magnalink. The instructions for these extra builds were often included in the LEGO Club Magazine of the time. Ok, on with the review! 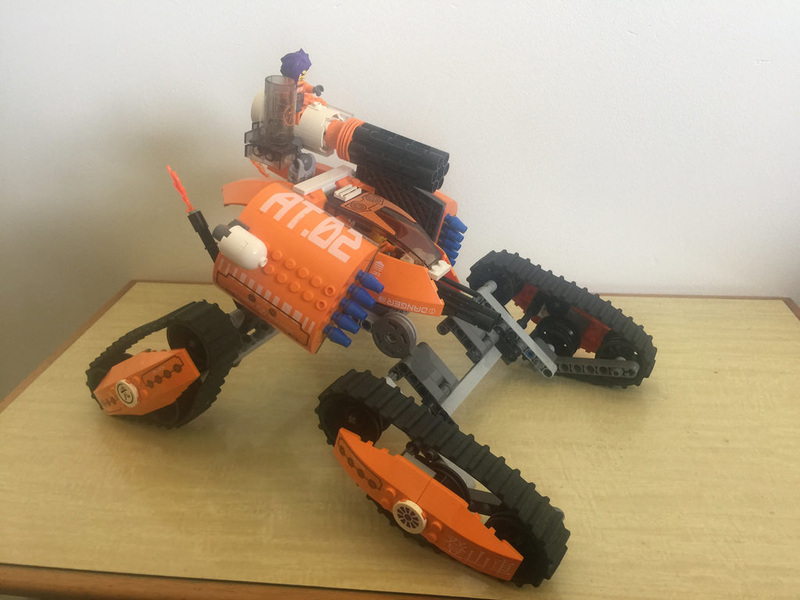 7706 is a interesting looking orange tank with four caterpillar tracked wheels, and two large weapon pods either side of the cockpit. Above the cockpit is a rather large turret gun. The elements included in this set are pretty unique. Firstly, let’s look at the minifigures. These are fantastic, with a very different design on the face to normal LEGO minifigures. Interestingly enough, according to Brickset, there’s two minifigures, that are the same character – Ryo. There’s Ryo the Gate Guard with black hair, and Ryo with purple hair. I’m not really sure what to make of that, but I shall trust in the wisdom of Brickset! 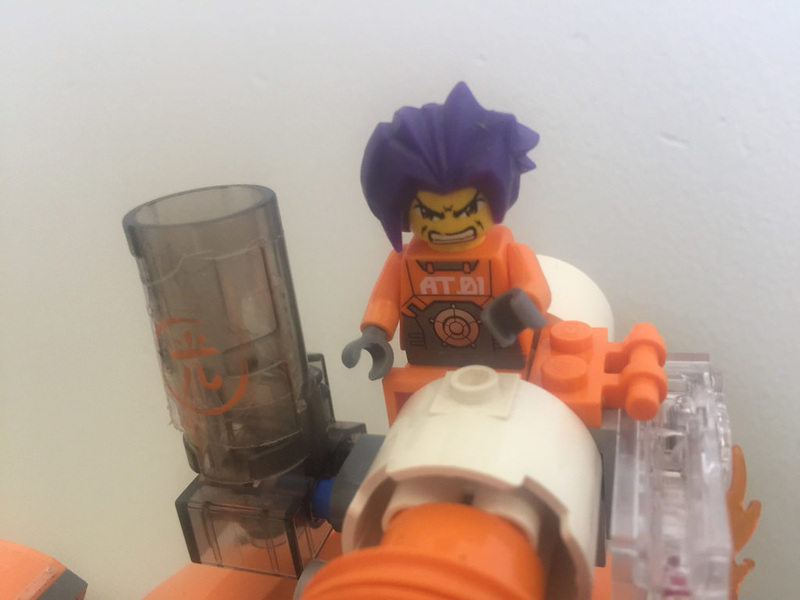 Anyway, the minifigures are decekd out in an orange jumpsuit, with some grey elements in there as well. The faces in all the Exo-Force sets have wider and larger eyes, akin to the Star Wars Clone Wars minifigs. They’ve also got some pretty interesting hair – it’s rubberised, and very unique. 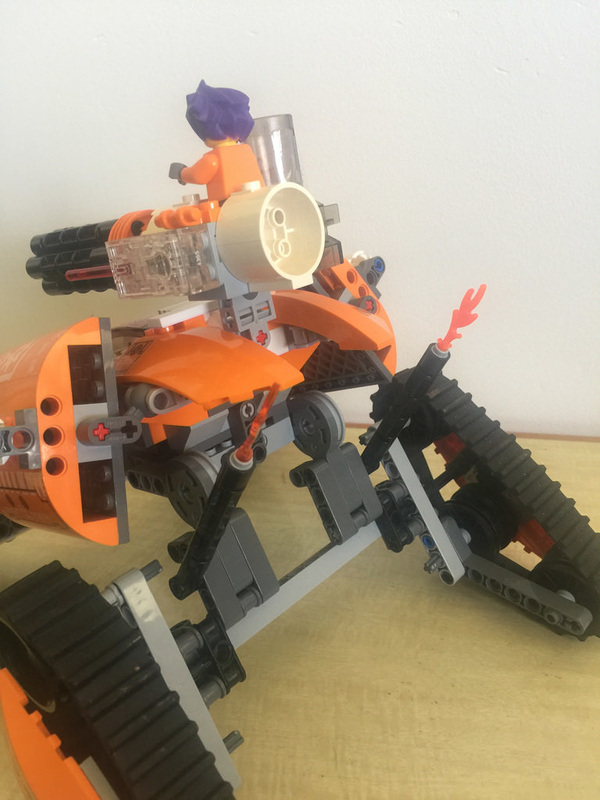 The tank has some pretty interesting parts, especially some of those in bright orange. 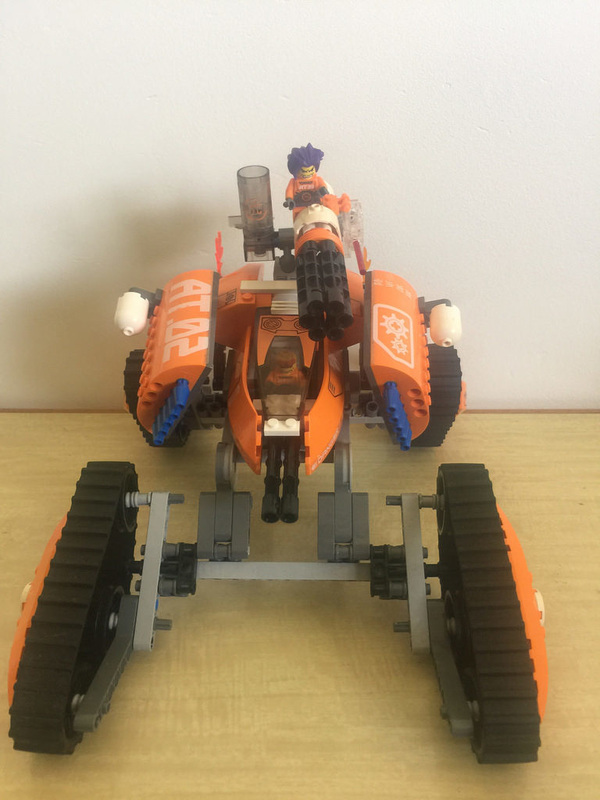 The two covers of the weapons pods are unique to this set, as well as a bright orange 1×10 brick, with many of the other orange parts being in one one other set. One of the amazing parts included in this set is the disc shooter. 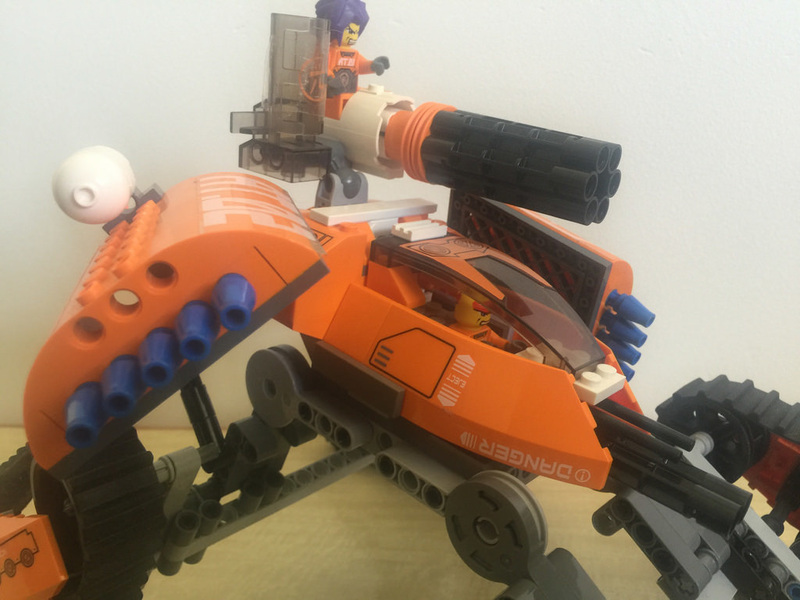 It’s unique to the Exo-Force theme, and shoots discs (der). I didn’t think it was a legit LEGO element, but sure enough, it is! It fires a pretty decent way too. Another interesting element is one I mentioned before – the light up brick. Again, it’s unique to Exo-Force sets, and the battery inside is able to be replaced, with a bit of effort. It’s a good thing, as mine are about to die – they are a little dim. There’s also the caterpillar tracks, the four 6M flex joints, ball joints, and a large assortment of Technic elements. This one was a little tough to rate. There’s plenty of swoosh to it, but because mine is a little old, the swooshiness is not perfect. The caterpillar tracks are a little stiff, and it can tend to collapse a little in the middle if pushed down too much, but apart from that, it’s fantastic. The weapons pods move around, the disc shooter fires a pretty good distance, and the tracks are very positionable. It’s pretty fun to move around. The build experience is actually pretty quick. While it’s a large build, there’s not really much to it. 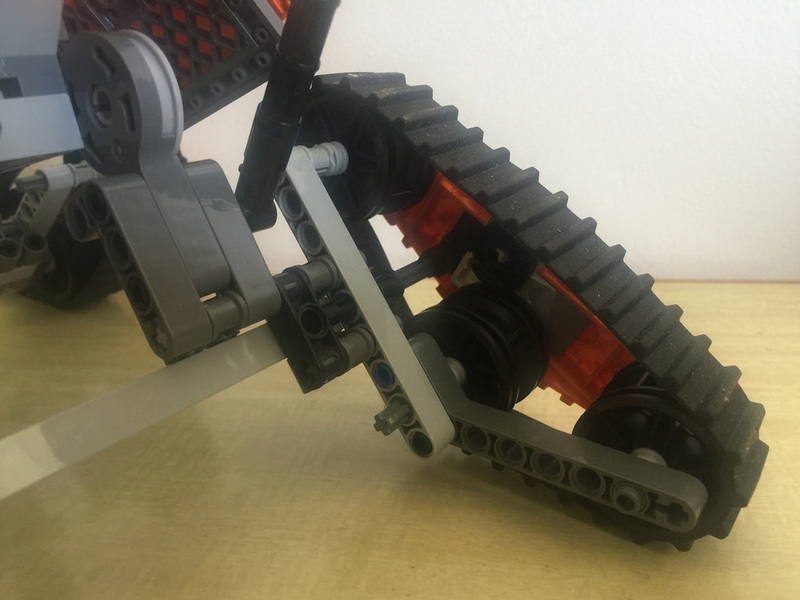 The wheelbase frame takes the bulk of the build time, and it’s quite repetitive, as it’s completely symmetrical. There’s not much to it, so it’s a little flimsy, but with the cockpit added, it gets a little more strength. Add the weapons pods to the ball joints, and the turret on top, and you’re done! It’s pretty good, as it’s positionable, but it still has a bit of loose flimsiness to it. I’d be careful driving it around! This set looks cool. I love the orange. It really helps the kit to stand out on the display shelves in my office! While the person at the top is a little exposed, I could totally see this sort of vehicle in a sci-fi flick, cruising over craters on the moon. It’s pretty great! I would like to see a little more armour around the chassis, but I’m still pretty happy with it. There’s some pretty unique parts in this set, especially if it’s your first Exo-Force set. That alone brings up the collectibility a lot, as there’s only a limited supply of them around now. The price isn’t too bad either. Expect to pay around AUD$40 for a used set, and closer to $100 for a brand new one. There’s al ot more of the used sets than the new, so maybe start there if you aren’t precious about the stickers or box. The parts are pretty great, and it’d certainly be unique on the shelves! Next week I’ll be taking a look at a mech from the Exo-Force theme – 7702: Thunder Fury. I love the names the mechs have – combine two mean sounding words, and there you have it! Let me know your thoughts in the comments. I’d love to hear what you think of this set!